The Arboretum will host its 2018 Native Gardening Conference, “Native by Design: Gardening for a Sustainable Future,” on September 16. The all-day conference runs from 8:45 a.m. to 4:30 p.m. and costs $65. Registration is required by September 6. Morning coffee, lunch, and afternoon coffee are included in the conference fee. Native plants have many benefits for the home landscape and the broader community. They are adapted to local climate, soil and other environmental factors. Because they evolved with other native species, some perform unique roles in local ecosystems. 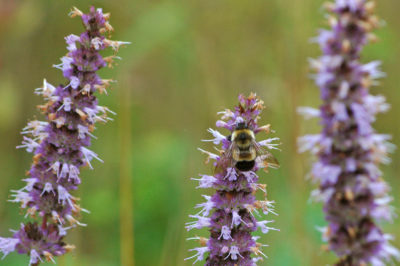 Native plant gardens use less water and no fertilizer or pesticide. They are a valuable resource for hundreds of wild pollinator species, and they support local biodiversity as well as migratory animals, including rare and threatened species. Arboretum, UW–Madison and other area experts will lead workshops suitable for a variety of gardens and home environments, from small urban yards to rural acreage. Sessions will cover native garden design (Evelyn Howell, professor, landscape architecture, UW–Madison), native shrubs and trees (David Stevens, Longenecker Horticultural Gardens curator), invasive jumping worms (Brad Herrick, Arboretum ecologist), garden planting and maintenance (Susan Carpenter, Arboretum native plant gardener), beneficial insects (Jennifer Lazewski, master gardener), sustainable landscaping (Frank Hassler, Good Oak Ecological Services), edible restoration (Judy Kingsbury, horticulturist and permaculture designer), attracting butterflies and moths with native plants (Karen Oberhauser, Arboretum director), and a tour of the Arboretum’s Wisconsin Native Plant Garden. A keynote address follows the sessions. Lynn Steiner will give this year’s keynote, “Native Plants in Urban Settings.” Steiner will focus on native plants that adapt well to urban gardens, enabling gardeners to create a beautiful landscape that can also provide habitat for birds, butterflies, and other wildlife. Lynn Steiner is one of the Upper Midwest’s best-known garden writers. She is the author and photographer of several books advocating the effective use of native plants in home landscapes, including Grow Native: Bringing Natural Beauty to Your Garden. Lynn grew up in northeastern Wisconsin. She has a bachelor’s degree in natural resources from the University of Wisconsin and a master’s degree in horticulture with a minor in agricultural journalism from the University of Minnesota. Considered the birthplace of ecological restoration, the UW–Madison Arboretum is a teaching and research facility that conserves and restores land, advances science, offers public outreach, and benefits from community involvement. The 1,200-acre grounds are home to protected prairies, woodlands, wetlands, savannas, springs, shoreline, a notable horticultural collection, and Wisconsin native plant gardens. It also offers 17 miles of walking trails and 4 miles of biking road as well as hundreds of learning and volunteer opportunities. The Arboretum is located between Lake Wingra and the West Beltline Highway. The main entrance is at 1207 Seminole Highway. The Visitor Center is open weekdays from 9:30 a.m. to 4 p.m., weekends from 12:30 to 4 p.m. Arboretum admission is free.